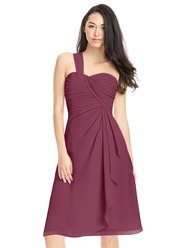 - Sweetheart dress features a strap detail at back. 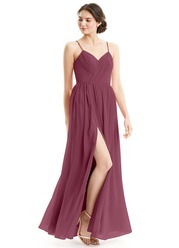 Sariah is a knee-length dress in an A-line cut. 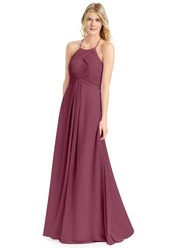 Made of exquisite chiffon, Sariah features an one-shoulder neckline. Available in full size range (A0-A30) and custom sizing. I was wondering if you could confirm how i should measure length (hollow to hem), when I am custom sizing. 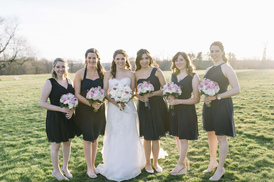 Even on a knee-length dress, It is critical that your height and hollow-to-floor measurements are correct. What happens is that we have a program that helps us alter the pattern to the correct sizing for your measurements. 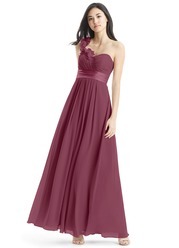 It uses the height and hollow-to-floor to calculate where the neckline, waistline, and hemline should fall. This dress met expectations. The color, material, and fit was exactly what we expected. 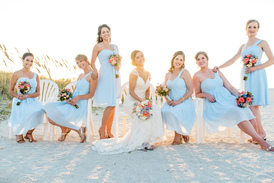 The dresses fit good and photographed well. 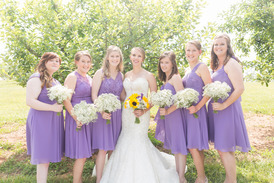 The bridesmaids were all different shapes and sizes yet this dress beautifully complimented them all. The only reason I didn't rate 5 stars was because the piece that goes over the should actually gapped on all of the ladies' dresses. You could do a quick alteration to correct this MINOR flaw. Now let's talk about this customer service! 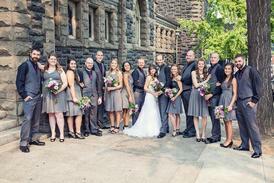 FedEx lost one of the dresses TWENTY-THREE days before the wedding! The dress take 3 WEEKS to manufacture. After FedEx was unable to locate the lost package, I contacted Azazie to open a claim. 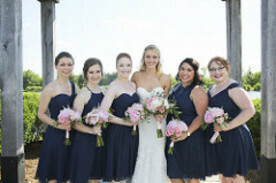 I spoke with Jessica who was able to keep me calm, expedite the remake and reshipment of the replacement dress which arrived a week before the wedding. I am so grateful to her for her professionalism during such a stressful time. 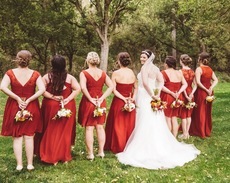 NOTE: my photo contains all the RED dresses ordered from Azazie, not just this one. The white gowns were purchased elsewhere. Aside from horrors with shipping (that weren't Azazie's fault, since I'm from the Netherlands), everything about this dress is PERFECT. I had a friend measure me and estimated that there could be about half an inch in difference, since the wedding I'll go to is only in two months. Well: the dress fits seamlessly. And when I say seamlessly, I mean that it fits me as if the seamstresses used me as their mannequin. 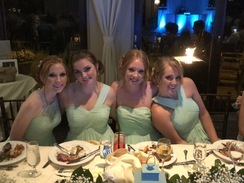 The next most important thing: our dresses were exactly (!!) the same color. We ordered ties with them as well, and even though they are made from a different material (silk), they too are almost identically colored. The top layer fabric is a wonderful light chiffon, the base layer something more sturdy (haven't checked what). 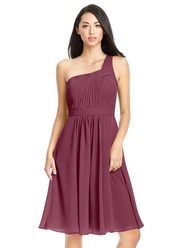 They're (loosely) attached at both seams of the hem, so that your dress doesn't crawl up weird when you move. Next to that, the bodice is made of an even 'harder' material, and is fortified with ribs (google translate calls them whalebones??) so that you still have a beautiful cup, and could even opt for a bra-less day. My cup size is small enough to benefit from this, but even bigger-busted women won't suffer from the support. The only downside is that the hook-and-eyelet closure of the dress is accidentally attached behind the zipper, so I can't fully close the zipper if I close that one. 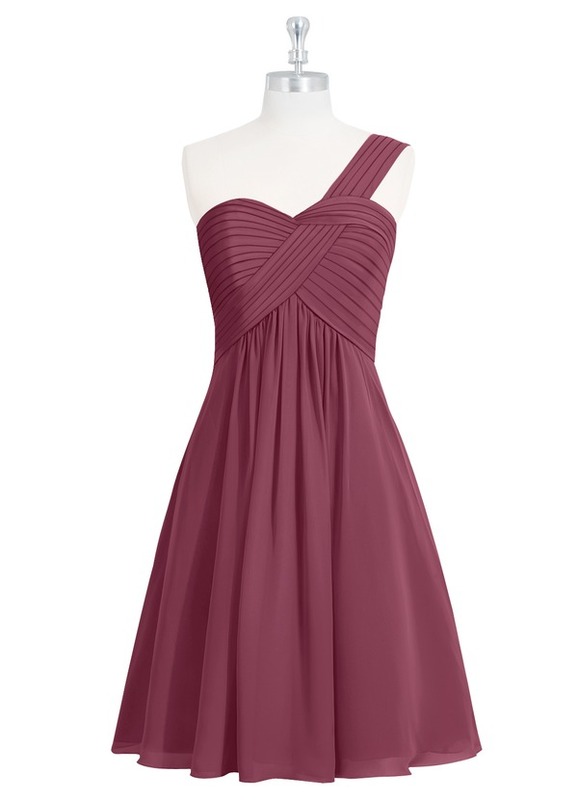 Then again, it's such a minor detail, it does nothing against the beauty of this dress. Azazie, a thousand times thank you! 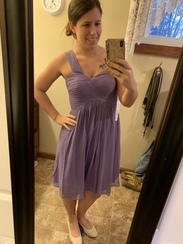 Great dress, great fit, had to get it slightly altered but nothing crazy! 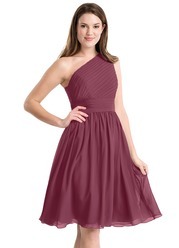 Excited to wear the dress at the wedding. I was amazed with this purchase! I had never heard of this site so I was skeptical, plus I couldn't find many unaffiliated reviews online so I was extra skeptical. Thankfully, I still decided to purchase this dress! 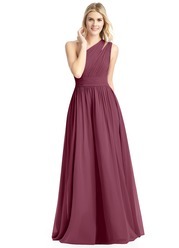 My dress was on clearance for $35, it's an amazing deal!! 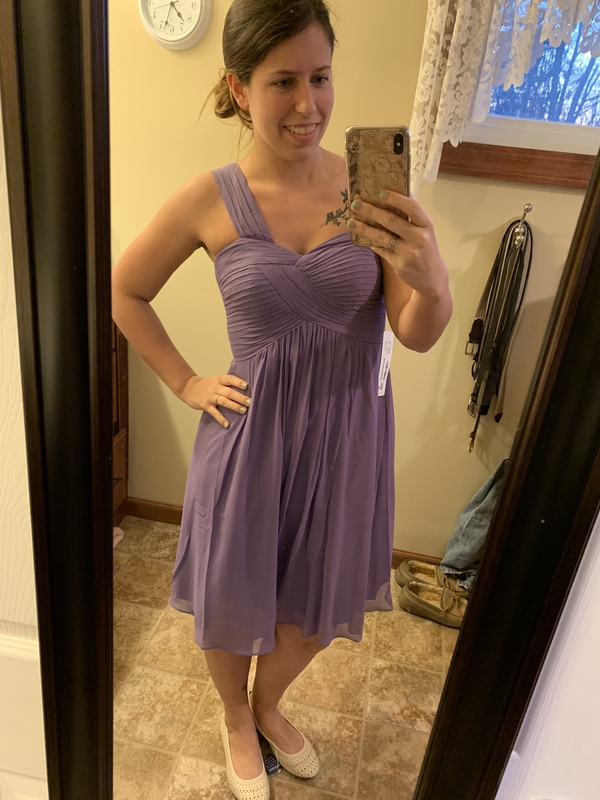 I was recently trying on dresses at David's Bridal so I ordered the same size from Azazie (size 6) that fit me at David's. And it fit like a glove! It feels like it was tailored just for me. The quality is far better than I expected, especially for how cheap it was. When it was shipped, it came in a box where the dress was nicely folded AND in a cloth dress bag! 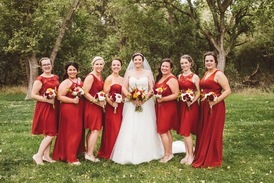 I'm two very different sizes in my bust versus my waist so I went the custom route in hopes of saving money on alterations and I'm so glad I did! I think the key component is to inhale during your measurements to get "breathing room". The dress also came sooner than expected and in a nice traveling bag (no fumbling with cheap plastic bagging on and off the hanger). The fabric was much nicer than I expected as well. I was additionally impressed with the built in support for the chest area. Great quality for the price. 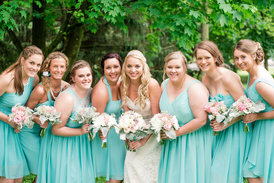 We all ordered sky blue dresses in different styles. They were delivered sooner than expected and they all fit! 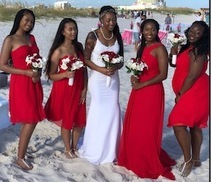 They looked great and we got so many compliments on the day of. 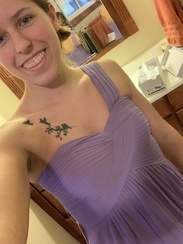 I would recommend making sure that a professional, or someone that knows what they are doing takes your measurements though, because I just did it myself and the dress ended up being a little big. 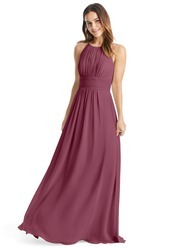 But Azazie is a great option for bridesmaid dresses! This was a nice dress, just not my favorite style.